Presenting world-class productions to a wider audience and making it more accessible globally, this latest in digital movie experience allows more people, who are unable to get to New York City, to watch The Met’s high-quality series of operatic performances. 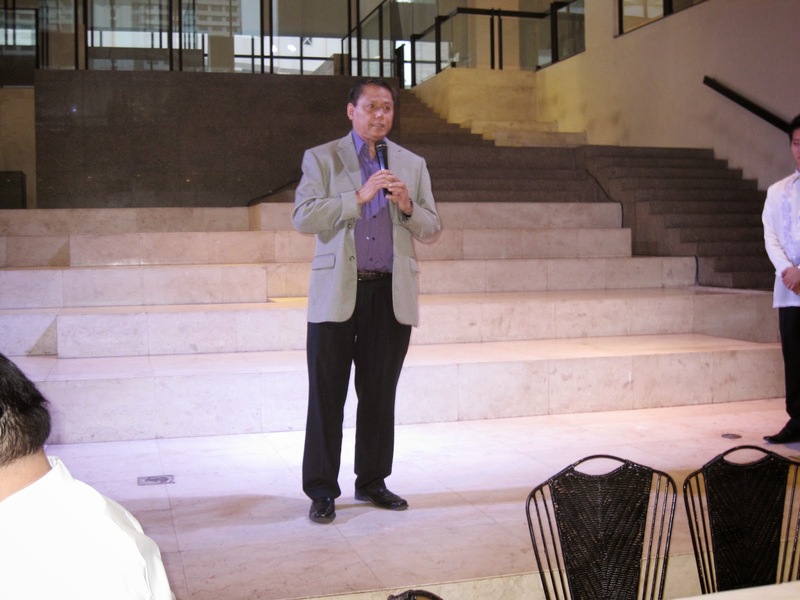 Through digital technology, the stage plays will be presented at Ayala Malls Cinemas’ Greenbelt 3 screens as it was recorded during their live performance at The Met – complete with backstage scenes, interviews with the actors and production crew. 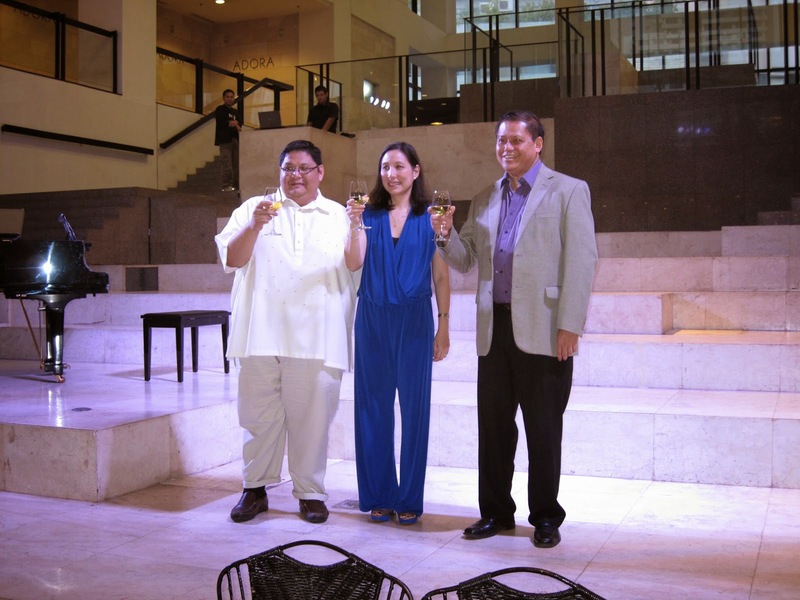 The recent opening gala at Ayala Malls Cinemas’ Greenbelt 3 featured the operatic stage play in HD “La Bohème” preceded by a program at Greenbelt 5’s The Gallery where two of the Philippines’ pride in the performing arts enthralled the guests eager for a whole new experience at the movies – soprano Jade Rubis Riccio and pianist Farley Asuncion..
Abuzz with anticipation of this latest offering from Ayala Malls Cinemas, guests were then treated to the first ever screening of “La Bohème.” This operatic masterpiece is Puccini’s moving story of young love is the most performed opera in Met history—and with good reason. Anita Hartig stars as the frail Mimì in Franco Zeffirelli’s classic production, with Vittorio Grigolo as her passionate lover, Rodolfo. La Bohème is an opera in four acts, composed by Giacomo Puccini to an Italian libretto by Luigi Illica and Giuseppe Giacosa, based on Scènes de la vie de bohème by Henri Murger. The world premiere performance of La Bohème was in Turin on Feb. 1, 1896 at the Teatro Regio, conducted by the young Arturo Toscanini. Since then, La Bohème has become part of the standard Italian opera repertory and is one of the most frequently performed operas worldwide. 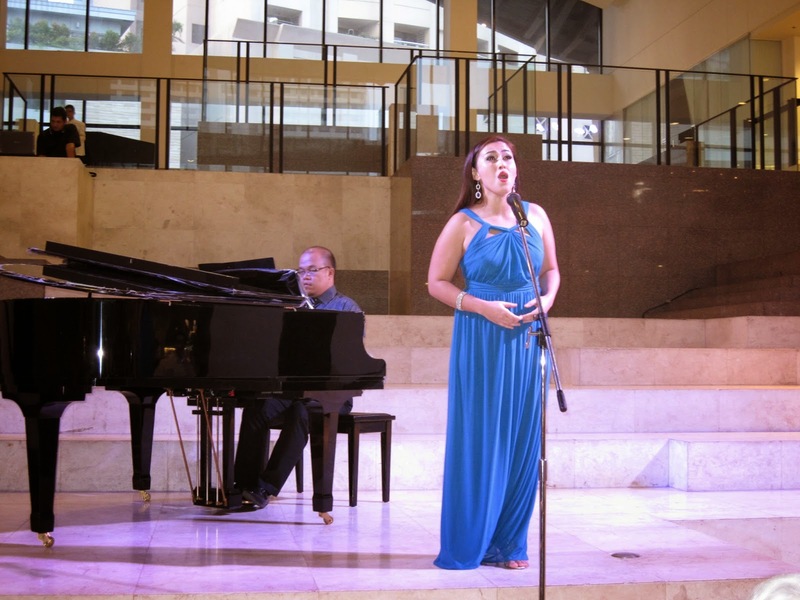 Following the onscreen gala of The Met Opera’s “La Boheme,” Ayala Malls Cinemas invites cineastes and avid stage play aficionados for the series of upcoming stage plays in HD at Greenbelt3 cinemas this October 14 featuring “Rigoletto” starting 6:30pm. “Rigoletto” is the Italian libretto written by Francesco Maria Piave based on the play Le roi s'amuse by Victor Hugo. Conducted by Michele Mariotti, its tragic story introduces Rigoletto, a hunchback sidekick and comedian, the licentious Duke of Mantuaand Rigoletto's beautiful daughter Gilda. The opera's original title, La Maledizione (The Curse), refers to the curse placed on both the Duke and Rigoletto by a courtier whose daughter had been seduced by the Duke with Rigoletto's encouragement. The curse comes to fruition when Gilda likewise falls in love with the Duke and eventually sacrifices her life to save him from the assassins hired by her father. Dmitri Hvorostovsky sings the title role of Verdi’s tragic masterpiece for the first time at the Met in this Michael Mayer’s dazzling production set in Las Vegas – the neon-bedecked hit of the 2012-2013 season. Included in the cast are Matthew Polenzani is the womanizing duke, and Irina Lungu and Sonya Yoncheva, sing the role of Gilda. 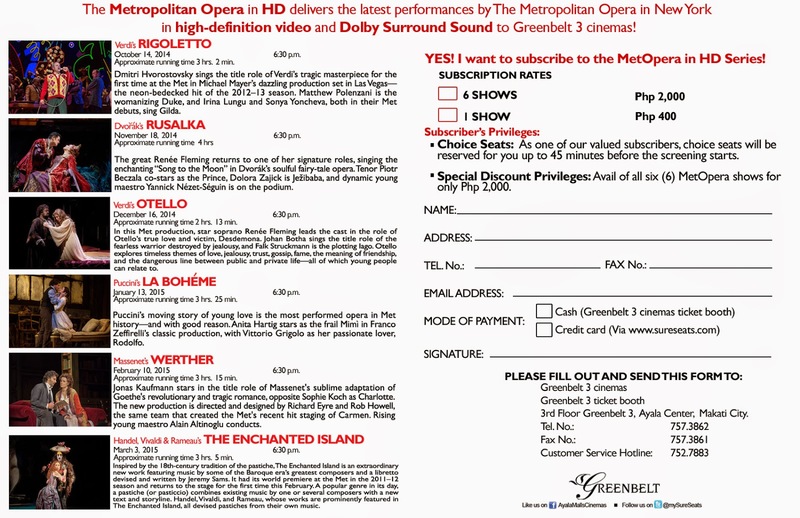 The Met’s Opera productions at Greenbelt 3 are valued at P400 per ticket, further Ayala Malls Cinemas is also offering subscriptions of all six Met Opera titles at a special rate – check out www.sureseats.com for more details. “Rusalka” on November 18. The great Renée Fleming returns to one of her signature roles, singing the enchanting “Song to the Moon” in Dvorák’s soulful fairy-tale opera. Tenor Piotr Beczala co-stars as the Prince, Dolora Zajick is Ježibaba, and dynamic young maestro Yannick Nézet-Séguin is on the podium. “Otello” on December 16. In this Met production, star soprano Renée Fleming leads the cast in the role of Otello’s true love and victim, Desdemona. Johan Botha sings the title role of the fearless warrior destroyed by jealousy, and Falk Struckmann is the plotting Iago. Otello explores timeless themes of love, jealousy, trust, gossip, fame, the meaning of friendship, and the dangerous line between public and private life—all of which young people can relate to. “La Bohéme” will then again be featured on January 13. “Werther” on February 10. Jonas Kaufmann stars in the title role of Massenet's sublime adaptation of Goethe's revolutionary and tragic romance, opposite Sophie Koch as Charlotte. The new production is directed and designed by Richard Eyre and Rob Howell, the same team that created the Met's recent hit staging of Carmen. Rising young maestro Alain Altinoglu conducts. “The Enchanted Island” on March 3. Inspired by the 18th-century tradition of the pastiche, The Enchanted Island is an extraordinary new work featuring music by some of the Baroque era’s greatest composers and a libretto devised and written by Jeremy Sams. A popular genre in its day, a pastiche (or pasticcio) combines existing music by one or several composers with a new text and storyline. Handel, Vivaldi, and Rameau, whose works are prominently featured in The Enchanted Island, all devised pastiches from their own music. 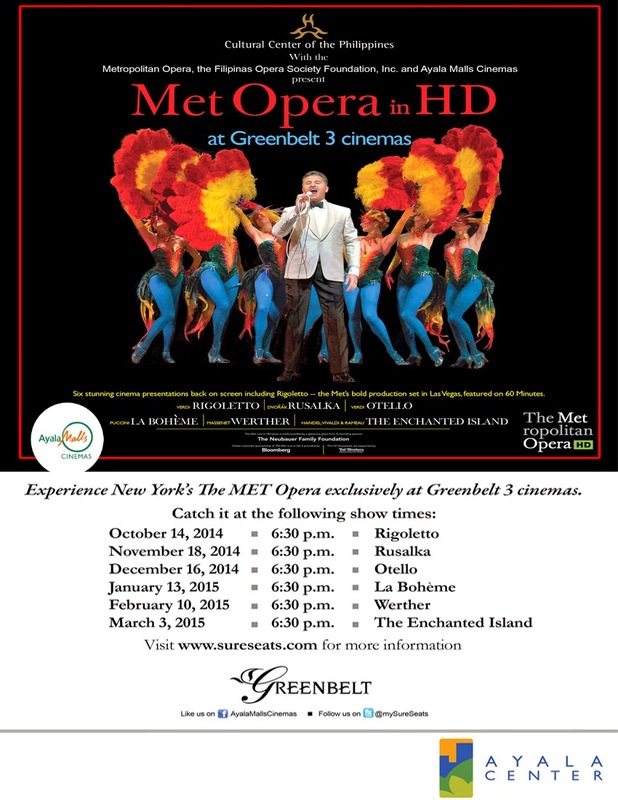 Log on to www.sureseats.com and like AyalaMallsCinemas on Facebook and follow them on Twitter @mySureSeats for more information on The Met Opera shows at Greenbelt 3 schedule and ticket reservation.